Hainan Airlines is operating some unique routes to/from China. Although their hub is in Beijing, Hainan operates a slew of point-to-point routes, which is helpful because they reduce the transit and positioning times necessary for travelers when flying hub-and-spoke routes. In addition, Hainan Airlines is one of the fastest growing airlines in the world. They have a great reputation for warm service, though they have traditionally lacked a strong hard product. 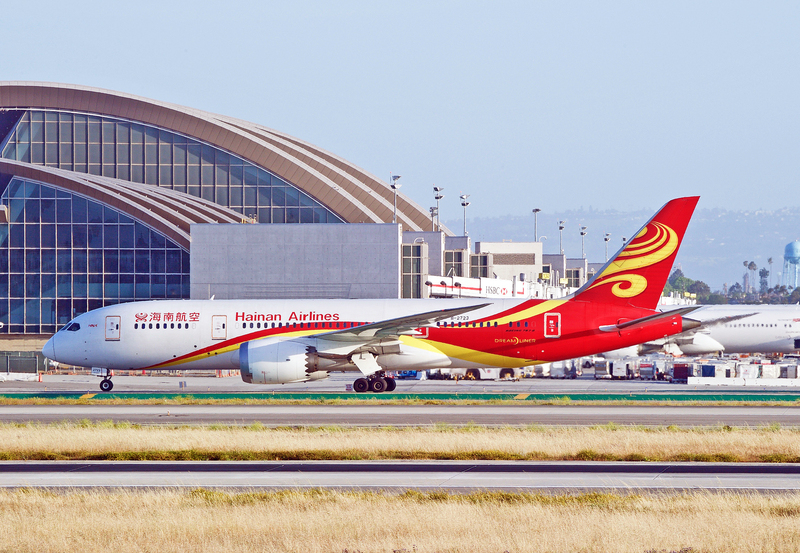 Here, we’ll explore all the different U.S. Hainan Airlines routes, and we’ll see how the various aircraft flown on these routes can provide different inflight experiences. Since Hainan Airlines isn’t in any alliance, it’s not easy to book with points and miles. Your best bet is going to be redeeming Alaska Airlines miles; Alaska Airlines is a transfer partner with Marriott Bonvoy. In addition, you can earn Alaska miles through the Bank of America co-branded credit card. Unfortunately, Hainan Airlines does not offer a first class option on its U.S.-bound aircraft. When flying on Hainan Airlines, you’ll experience warm and jovial service. The soft product includes a Nespresso machine for your enjoyment, Bulgari amenity kits, pajamas, and limo service when booked in specific fare classes (not award bookings, but discounted business class fares count!). As you can see, the soft product is definitely not lacking. Hainan Airlines’ pitfall has traditionally been their hard product, though they have made huge strides in retrofitting their fleet with more modern business class products. 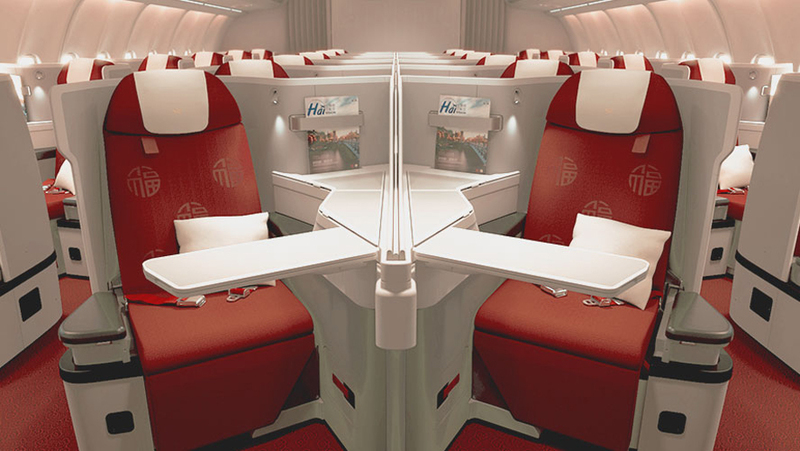 Hainan Airlines has been retrofitting its fleet with a new business class seat. These reverse herringbone seats on their newer 787-9 Dreamliner are arranged in a spacious 1-2-1 configuration. With all seats offering direct aisle access and fully lie-flat beds, this business class is very competitive with other airlines’ seats. The 787-9 Dreamliner is quieter, more fuel-efficient, and features a self-service bar, which is a welcome improvement to the old products. Additionally, you can chat with other passengers and utilize an upgraded inflight entertainment system. Hainan Airlines new 787-9 business class seat map. Image courtesy of expertflyer.com. 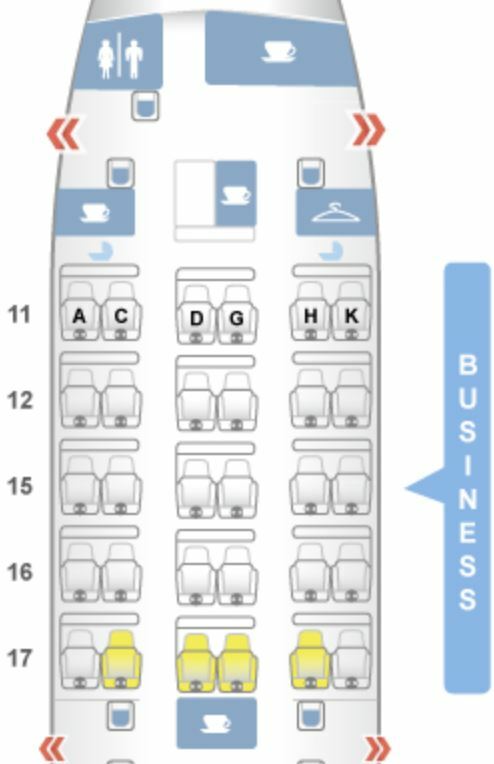 In total, there are 38 business class seats in this configuration. The lavatories are actually located at the very front of the aircraft, so sitting in row 11 will not be ideal. The best seats are likely toward the back of the business class cabin closer to the galleys. Hot Tip: Choosing row 19 seats can be ideal for minimizing the foot traffic you’ll encounter. Second place goes to the older 787-9 business class, which has seats in a 2-2-2 configuration. All of these seats are forward-facing and straight, as opposed to the angled reverse herringbone of the new 787-9. Still quite spacious, these seats are 22″ wide and 74″ in pitch. Unfortunately, not all seats feature direct aisle access, and this is a less private seat design. Hainan Airlines old 787-9 business class seat map. Image courtesy of seatguru.com. 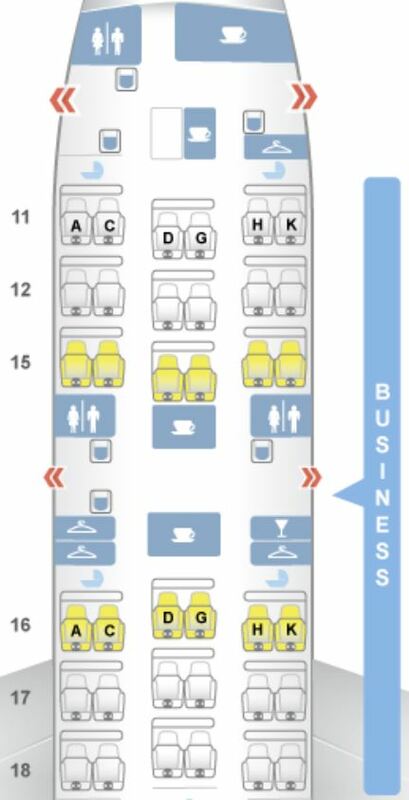 The best seats will likely be in rows 16 or 17, since the business class lavatories are at the front of the plane. However, the galleys behind row 17 may be too close for comfort, making row 16 probably the best compromise when it comes to seat selection. Hainan Airlines operates an older version of the Dreamliner, which they first put into service in 2013. Since then, technological advances pertaining to cabin noise and climate control have been made, resulting in the 787-9. But Hainan will continue to fly the older 787-8 until it’s replaced with a more modern aircraft. Here, there are 36 business class seats in a 2-2-2 configuration. These seats are 22.5″ wide and 74″ in pitch, which means these seats are actually half an inch wider. Even so, in our ranking, the incremental benefit of a half-inch is trumped by the perks of flying on a 787-9 as opposed to the 787-8. The difference in cabin climate control is simply too big to overlook, as it makes for a much more comfortable flight. Hainan Airlines 787-8 business class seat map. Image courtesy of seatguru.com. The best seats will likely be at the very back of this business class cabin, since it’s as far as possible from the lavatories. As a result, you will want to stick with seats in either row 17 or 18. Until recently, Hainan Airlines did not offer a premium economy seat on any flights to/from the United States. But with the roll-out of the new 787-9 featuring reverse herringbone seats, there has also been the addition of premium economy. 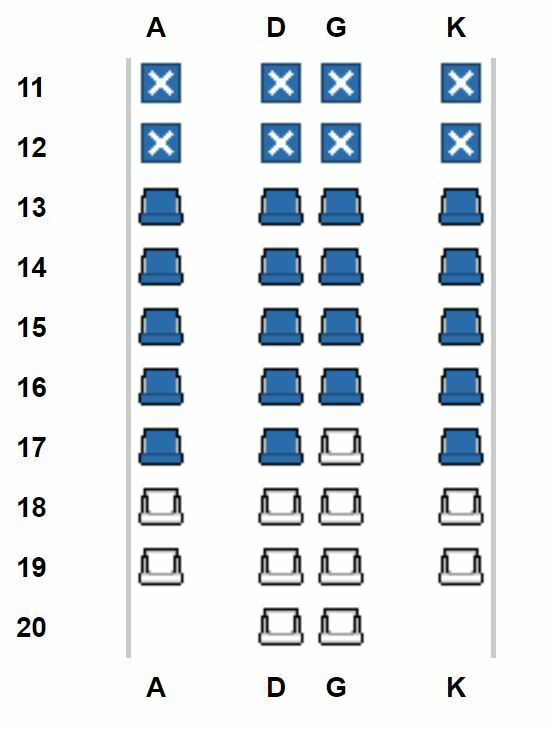 This is still a little-known premium economy product, but we do know there are 36 premium economy seats on the new 787-9, arranged across 4 rows in a 3-3-3 configuration. Hainan Airlines New 787-9 premium economy seat map (boxed in red). Image courtesy of hainanairlines.com. Honestly, these seats seem less like premium economy and more like economy plus. The only thing seeming to differentiate them from economy is the seat pitch, at 4″ more. Hainan Airlines 787-8 economy. Image courtesy of hainanairlines.com. The new 787-9 features an economy class cabin that is configured in a 3-3-3 arrangement; each seat is 17″ wide and 32″ in pitch. The main reason why the 787-9 wins out is because of the design of the aircraft; the cabin won’t be as dry and it’ll be more enjoyable for travelers. Hainan Airlines new 787-9 economy class seat map. Image courtesy of expertflyer.com. The best seats will be in row 46 due to the positioning of the exit row, but you’ll want to avoid 46A and 46K due to the protrusion from the exit row door. Keep in mind that these seats are close to the lavatories, so you’ll want to weigh the pros and cons of this choice before making a decision. Hainan Airlines old 787-9 economy class seat map. Image courtesy of seatguru.com. The best seats will be in row 46, just like in the new 787-9. Similarly, you want to avoid 46A and 46K due to the exit row door impeding your leg movement. Another option for extra legroom is row 31, at the very front of the economy class cabin. But be aware of the proximity to the lavatories and galleys, which may cause an inconvenience at your seat. Hainan Airlines 787-8 economy class seat map. Image courtesy of seatguru.com. The best seats will be in rows 31 and 40, due to the exit row providing additional legroom. Row 31 is more preferential than row 40 due to the absence of lavatories. All in all, there are plenty of routes flown by Hainan Airlines. Some of the 13 U.S. routes are point-to-point, while others are hub-and-spoke. Hainan Airlines doesn’t have the best business class products on all their planes, but with this guide you should know what to look for — and if you know which aircraft has the best product, you’re in for a real treat. Hainan loves using the 787 Dreamliner, and being able to differentiate between the different models is absolutely instrumental in maximizing your flight experience. Now you know everything you need to plan out your Hainan Airlines trip! What's the best way to book Hainan Airlines first class? Unfortunately, Hainan Airlines does not operate a long-haul first class product on their U.S. routes to/from China. What's the best way to book Hainan Airlines business class? Your only option is going to be using Alaska Airlines miles. One-way flights in business class cost 50,000 miles and include a free stopover! You can earn Alaska Airlines miles directly from co-branded credit cards or transfer points from Marriott Bonvoy at a 3:1 ratio to earn Alaska Airlines miles. For every 60,000 Marriott points transferred, you will get a 5,000-mile bonus. What are the best ways to book Hainan Airlines premium economy class? Hainan Airlines doesn’t offer a premium economy section on any of their flights to/from the United States. What's the best way to book Hainan Airlines economy class? Hainan Airlines charges 30,000 Alaska Airlines miles one-way for economy flights between Asia and the United States. This also includes 1 free stopover, which you can use to get a free flight if you want to maximize the value! Alaska Airlines is a transfer partner with Marriott Bonvoy, in addition to having their own co-branded credit cards with Bank of America to let you earn Alaska Airlines miles directly.